We are pond specialists and offer a full service solution for your pond and water garden needs. Whether you are looking to build a new pond or upgrade an existing one we can help! Please see below for the services we can offer. Please see an overview of our services below. If what you are looking for is not set out below, do not despair. We carry out a wide range of pond services. Contact us to discuss your needs and see how we can help. We can create ponds of all sizes from small garden ponds right up to large commercial water features and lakes. Our teams can excavate and remove waste, specify all of the most modern equipment, line the interiors (using a variety of different materials from sheets to chemicals dependent on your preference), and leave you with a great system ready for use. Head Squared Aquatics specialises in fitting new filtration systems for ponds and upgrading existing filter systems. From small systems for garden ponds, up to large advanced commercial filtration systems for large water features we do it all. 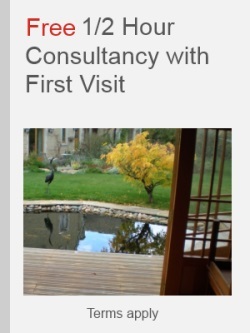 Our expert staff will spend time getting to know your pond and identify the ideal system for your needs. We can help ensure that your pond is a part of the garden to be enjoyed and proud of! Head Squared Aquatics can offer a full range of professional reline services to give the best finish for your pond. We can provide Butyl style liners, render or even great quality fibre-glass finishes. Head Squared offers a swift and easy pond cleaning service. A Head Squared clean will help keep your fish happier and healthier and give you a water feature to be proud of. We also offer regular maintenance visits in Leicestershire and the surrounding areas: Leicestershire Pond Maintenance. Head Squared has experience with many other problems which can arise relating to water features/ponds. Please contact us with your specific problem to see how we can help. We can help with issues such as green / dirty water, filter problems, pond leaks, fish health issues, and many more. 1 Terms apply. Please see Free 1/2 hour consultancy for full details.